What do you think when you hear the word “data”? Do your eyes glaze over? Do you immediately picture a room full of serious-faced people, eyes fixed on their computer screens, hunched over their keyboards, crunching numbers? What if we told you using data is more like this? It’s more of that “aha!” moment when everything starts to come together – that moment of clarity when you see the big picture that “Big Data” is showing you, and you can make clear, rational business decisions based on facts, not just guts. These are the top six reasons we love data … and you should, too! From the role data plays in our processes to the magic we can work for our clients, we can’t get enough of the stuff. Given the choice, is it better to build an app or create a mobile responsive website? Data can tell us exactly how users interact with a current website or mobile app and thus better inform that decision – instead of us or a client guessing which one to invest in. Is there a pain point that could be solved with a technology solution? The first step would be to analyze usage, customer feedback, and other data sets to uncover where the actual pain points are – or to determine whether a perceived pain point is actually a pain point or not. Data can also tell us more about sales cycles, sales funnels, and sales seasonality. Armed with this kind of in-depth information, we can partner with clients to make informed decisions about the types of technology solutions that would be best for their business cycles. Diving into your data can potentially tell you almost everything you need to know about your customers, from their likes and dislikes to consumer behavior. Don’t just guess about what would drive more foot traffic into your store or what consumers really want to buy each season. Gather the raw data and then analyze it. Then, you can find meaningful ways to apply the data to your marketing and sales efforts and capitalize on consumer behavior. Beyond basic demographics and like-dislike information, data can give you highly sophisticated information about things like how your customers are using your products, what they are calling your support team about, and when they are engaging with your sales team, social media channels, or your app. This kind of data can help you to improve your product line, your support services, how you communicate with consumers, and a host of other areas throughout the buying cycle. Are your users experiencing unexpected problems with your app or website? Are there bugs you didn’t know about or features they wish they had? Diving into your customer support data can also give you fresh ideas about how to improve your products and services – improvements that are market-driven, not company-led. Are website visitors abandoning their carts? Are they not converting on your landing pages? Data can help you to pinpoint where and why that might be happening, so you can improve the design and functionality of your website. Data helps us spot mobile trends, usage trends, and other insights that help our team of developers create solutions for clients that their users love! What’s even better is that, because we use data to inform our decision making in the first place, the cool things we make for our clients are actually successful. Is there a disconnect between the ecommerce orders coming in through your website and the shipping of those orders? Data often reveals disconnects and where the disconnects are happening in the process, which then creates an opportunity to address those disconnects and solve specific pain points for our clients. For example, we discovered for one of our lab clients that once a patient was given his or her lab results, there was a disconnect in communication between the lab, the physician, and the patient. Our solution was to create a platform via a mobile app that allowed the lab, the physician, and the patient to track progress together. This made follow-up easier for everyone involved and helped create a more consistent health history for patients. Finally, how do you know whether your campaigns, decisions, and products are successful if you don’t have data to prove it? Data tells us what’s working and what’s not working, so we can improve, celebrate, or move on. So forget crystal balls and silver bullets. The truth of the matter is that when used properly, data really can give businesses all the answers they need regarding inventory, processes, marketing, sales cycles, and so much more. And what’s more, numbers don’t lie. They are objective, fact-based glimpses into consumer behavior and process-based outcomes. If you have the right data analysts to interpret the data properly, and the right dashboard for easy access to all the updated data you need, you’ll be able to make better decisions and make them with confidence that they will lead to the results you want. No more guesswork, because you’re working off facts. 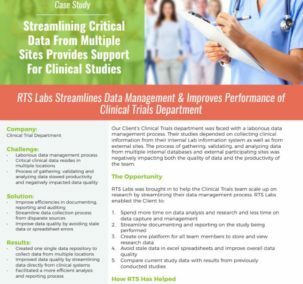 From better decision making to product improvements, what we love most of all about data at RTS Labs is that “Aha” moment our clients have when they see how all the pieces of the data puzzle fit together. When they have a problem and we help them find a data-based solution to that problem – it’s one of the best feelings in the world. And this is why we love data at RTS Labs – and why any savvy business owner should get excited about data, too! Want to see firsthand what positive, responsible data analysis and business intelligence look like? Download our case study below!